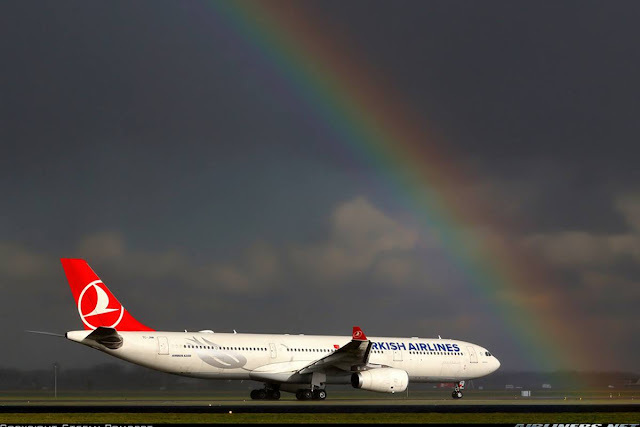 Welcome to my trip report on Turkish Airlines! When I saw Turkish doing this flight sector, I was excited because I won't have to do SIN-IST just to experience this airline. I heard lots of positive reviews of this airline and how much improvement the airline has made, so when this opportunity came, I grabbed it. This flight, TK68 begins in Istanbul (home base) and flies to Ho Chi Minh City with a stopover at Bangkok on a daily basis. Fortunately, traffic right was given for the Bangkok-Ho Chi Minh sector unlike TK67's SIN-CGK sector. There was a period of time, flights on this sector was bookable, but my guess is that because of SQ, local traffic of that route was closed not long after. I did email to the airline about it, but there was no way to come about booking on it. Schedule aircraft was supposed to be Airbus A340-300, but checking on the history of the flight, a mixture of A330-300 and A340-300 were used, so it comes down to your luck. I wanted the A330-300 for a reason, it would be my first Roll-Royce Trent 700 powered A330-300. After flying on this, I would have completed all the 3 engines powering the A330-200 and -300. Nice boarding pass. This time, I had no problem checking-in online or with the counter staff. Everything went very smoothly. In fact, the counters were empty when I was there. Unlike my Royal Jordanian's experience, the check-in process was as smooth as silk. According to the staff, the flight was not full, but later on it turned out that the back section of the aircraft was filled with 2 tour groups returning to its homeland. Good for the airline, but bad for me. Nevertheless, I was going to enjoy the short flight. Checking from a reliable website, I was flying TC-JNK, an Airbus A330-300. I had about 2 hours to spare, so I walked around the airport, finding something to eat. Found a Thai restaurant and I had pineapple rice and coconut for lunch. The price is a bit pricey though but food portion was reasonable. After that, I headed to the furthest G5 gate. My ride: TC-JNK which arrived from Istanbul. These photos were taken about an hour before boarding. This place was to be quite full after half an hour. My first impression on board was, "Wow!" Looking at these seats, the rainbow colours remind me of Malaysia Airlines's 734 cabin, but this is much nicer. I always love the A330s and its 2-4-2 seating configuration. I would fly on this aircraft to IST if there is an opportunity. Soon, the boarding announcement was made and I was the first person heading down the aero-bridge, towards the aircraft, to catch some photos of the empty cabin before it was filled up. Always nice to have a usb connector to charge your Iphone or play your video or music video off the IFE system. Camera view from the nose gear. Can you spot some mistakes? I must say I am quite impressed with the PTV system. It is touchscreen, easy to use and lots of entertainment program to keep you entertained especially for long haul flights. Despite some errors in the aircraft fleet, the system itself is flawless. Its fast and there is no bugs or anything to worry about. Even though this was a short 1 hour flight, earpiece was provided (complimentary) just like Royal Jordanian. I would give this a rating of 9/10. The aircraft pushed back about 5 minutes after schedule departure due to late arrival of some "wonderful" passengers. However, the pilots told us we were arriving early, so that didn't matter. The weather was perfect for flying and soon we were at the threshold, we were number 2 for departure. In front of us was a SQ Boeing 777-200ER heading back to its home base, Singapore. The take off was de-rated which meant only that full power wasn't used. I would say (due to my experience), only 70 percent power as the plane took quite a while before lifting off. This method would certainly help save fuel for the airline. The take off was pretty smooth, just a bit of bumps and shakes but before we knew it we reached our assigned FL240. Service on board was surprisingly good. Even the difficult and unreasonable passengers didn't make the crew lose their cool. The European crew were patient, efficient and were pretty much in a good mood with smiles on their faces. I was pleasantly surprised! See how good the flying condition is? No CAT (Clear Air Turbulence), and that makes flying very enjoyable! Anyway, we touched down early and taxied about 10 minutes to the assigned gate. My short flight came to an end and it was definitely not enough! Anyway, for the passengers it means the end of the journey especially those who flew in from Istanbul, long and tiring trip for them while for the crew they will return to Bangkok and possibly rest for a night or two before flying back to Istanbul. Got myself a cup of apple juice with complimentary snack which is good enough for a short flight like this. I know of certain airlines that serve only a drink and a packet of peanuts, so thumb up to the airline for that! This has to be one of my best flights on this trip. Its opposite from what I had experience with Royal Jordanian, far better in most areas. I paid S$150 for one way trip and its value for $$. I heard positive review of this airline especially its new product and I am equally as impressed. The service and in-flight product has certainly left me with a positive impression and I highly recommend you guys out there to give this airline a try. I need to try the long-haul sector in the near future and hopefully the Boeing 777-300ER! I collect air tickets as well, sorry I am not able to help you on this. ve may bay quan 6 Such a good report, really high quality, I appreciate it.